Firstly, I know that your birthday was actually the 2nd of September and right now, it is the 23rd. Your birthday marked the beginning of Spring and sun and fun so I am sorry I could not get you your present by then to celebrate because, as you know, we were studying biology/Facebook stalking + Youtubing Michael Jackson videos from that time on. But now that it (the unmentionable period) is all over, I hope you enjoyed your tart. Do you want to know why I made chose this dessert this year for you? There, I admit it. What are you going to do about it? Admit it. Sometimes waiting for an oven seems like a lifetime, especially when your batter is slowly decreasing in amount… That is where the microwave comes in. Now I make many microwave desserts. 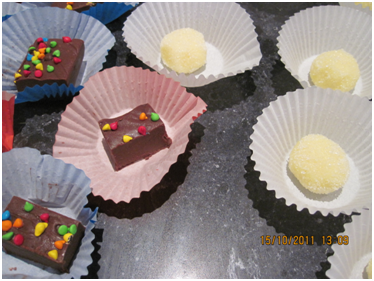 A brilliant 5 minute chocolate cake, cheesecake and want to try brownies. The only thing that has failed is a peanut butter cookie. I want to add this to my repertoire. Simple, perfect and beautiful to eat. 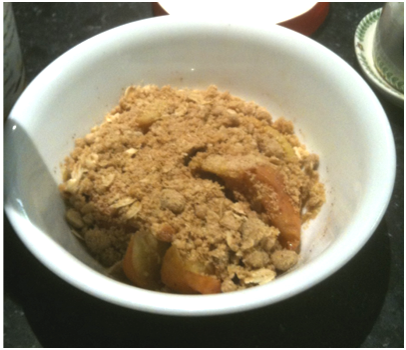 This crumble is warm and tender and reminds me of a big hug at 12 midnight!